This user was certified a Wiki Apprentice Level 2 by Tatejoris . 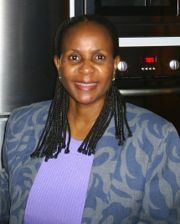 My name is Fancy Amey and I work for BOCODOL-the Botswana College of Distance and Open Learning (BOCODOL). My background is in teaching and I taught for nine years at secondary school level before I joined the distance learning environment. I started as a student advisor in 1990 at the Department of Non-formal Education (DNFE), a government organisation that offered secondary school programmes to young people and adults who for one reason or another were unable to do that through the conventional school system. I then transferred to BOCODOL in 1998 as part of a nuclei team that set up BOCODOL as a parastatal institution. I am currently head of Learner Support Services for the College. My interests are in the development of learning support models particulalry in challenging environments. BOCODOL is reknowned for its open schooling sector and robust learner support model but I believe in making learning fun and enjoyable for learners; an experience to take away and promote it for generations to come at any level. We have just introduced tertiary level programmes and are challenged to rise to the occassion. Am glad for the opportunity but need help to take our support systems to the next level! Technology innovations that are user frindly (not bulky, low maintenance and versatile). This page was last modified on 28 March 2009, at 18:10.